A decade ago, I didn’t know a horcrux from a ham hock, and Hogwarts sounded like an obscure affliction of the skin that no one willingly would discuss in mixed company. That was then. Now I know that seven horcruxes had to be destroyed before Harry’s epic encounter with evil Lord Voldemort. Like gazillions of others, I’ve been Potterized — at least enough to realize that you never want to meet a Death Eater in a dark alley, that Quiddich is played with broomsticks and that author J.K. Rowling has an undeniable talent for inventing words. If you don’t know what the hell I’m talking about, you are part of the fringe that has managed to escape Pottermania, and need read no further. The rest of you should know that the big-screen series adapted from Rowling’s amazingly popular books has resulted in some good movies, at least one so-so movie and an overall achievement that deserves a hearty round of applause. Fans can rest assured that director David Yates has brought the series to a dark, exciting conclusion with Harry Potter and the Deathly Hallows: Part 2. Part 1 seemed to be marking time, holding us at bay until the final battle could be joined, which means Part 2 (stay with me here) is really the third act of Part 1. That makes the entire movie into a kind of grand finale, resulting from Warner Bros.’ decision to split the final Potter book in two. It’s finally time for Harry, Hermione and Ron to call a halt to Voldemort’s nefarious plans, a situation that allows the filmmakers to unleash a torrent of special effects — from chalices that multiply on their own in an underground vault to zap-zapping wand fights that (alas) always remind me of something out of an old Flash Gordon serial. Screenwriter Steve Kloves brings the proceedings to an operatic conclusion that’s beautifully complemented by composer Alexandre Desplat’s ominous score. There’s a near-majestic quality to some of the events in Part 2. A sequence in Gringotts Bank — with goblins hunched over thick ledgers — is a triumph of imaginative design. Much of the series’ success involves the fact that the Potter cast has remained intact, save for the passing of Richard Harris, who originally played Dumbledore. This consistency has allowed us the pleasure of watching the movie’s three stars — Daniel Radcliffe (Harry), Rupert Grint (Ron Weasley) and Emma Watson (Hermione Granger) — grow into young adulthood. In this action-oriented conclusion, little remains to be revealed about our stalwart trio; they’re fulfilling the destinies that Rowling set out for them. Casting — not only in the main roles, but also in the supporting roles — remains pitch perfect. Ralph Fiennes imbues Voldemort with a sinister purity that’s truly unnerving. Michael Gambon (as Dumbledore), Robbie Coltrane (as Hagrid), Maggie Smith (as professor McGonagall) all return, as does Alan Rickman, who plays Severus Snape. If Rickman wanted to prolong his screen time, he did a good job: Like someone giving a master class in enunciation, he stretches every syllable to the breaking point. Ciaran Hinds joins the fray as Dumbledore’s brother. And, yes it would be something to see a cast of this caliber in a non-Potter movie — and I haven’t even mentioned Helena Bonham Carter, Julie Walters, David Thewlis. A word, if I may, about 3-D. This edition is available in 3-D. The 3-D is by no means awful, but cinematographer Eduardo Serra’s darkly hued images seemed even darker when viewed through 3-D glasses, nicely shaped to replicate Harry’s trademark specs. Now, if you’re tempted to let your mind wander en route to the climactic battle, don’t fret. 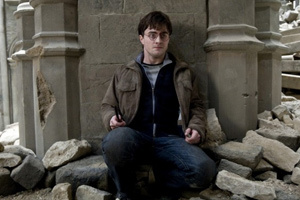 You will be snapped back into attention as Harry faces Voldemort in a battle that produces so much rubble, it must have forced Hogwarts to embark on a major rebuilding campaign. Not wanting to leave us trembling from all the unleashed fury, Yates includes Rowling’s epilogue, which takes us 19 years past the final battle and allows for an appropriate goodbye to characters that have become part of pop-cultural consciousness. Harry, Hermione and Ron have matured over the course of a decade, as has much of the Potter audience. And although I’m not a Potter zealot, I admit that there’s something undeniably satisfying about having gotten through a tumultuous decade with characters that first reached the screen a couple of months after Sept. 11, and remained to see us through. For its most ardent fans, Harry Potter has been a series to grow up with — not grow out of, which partly explains why they love it so much and why it has been such a unique success: on the page and in this smartly executed final chapter.